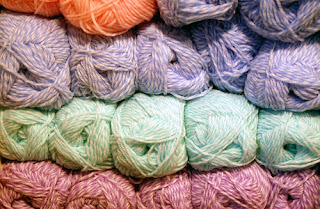 PR Dad said the other day that yarn was like my crack. He also claims that craft stores make him sleepy. He claims its the lighting. And this is from a man who suffers from insomnia. Go figure. But I really do love yarn. So much that I am looking forward to Bass Lake to see if the Yarn Barn is still there. Sad i know, but I really love knitting and crocheting. I know, its not very punk rock, but I cannot help myself. And the other day I found out that my buddy Angela also has a secret. She knits and is taking a sewing class! (Guess its not a secret anymore!) And I was so happy to have a friend (and one that I consider "cool") to share knitting stories and patterns with. The other day PR Dad was watching a dating show. It was about a dating coach following this girl around on dates and giving her advice. The guy asked the girl if she had any hobbies and she says "Yes, I knit, and I bring it with me everywhere!" She them brought out a ball of yarn and needles from her bag. The dating coach was floored and instructed this girl to never ever do that again. It was a deal breaker. I cannot figure out a way to make knitting and crocheting cool. Maybe some needles with flames and a skull knob on top. Should we have knitting circles where we listen to punk music really loud. Or maybe it needs a cooler hipper name like, extreme fabric modification. I don't want to love it has much as I do, and I don't it to take up as much free time as it does, but I really do enjoy it! we're totally cool! I'm laughing about the dating coach because I knit on the train in to work and all these women pull out their yarn from their purses! There are all sorts of different knitting clubs. I know that in Ventura, there was a college-aged knitting group where they met each week (at The Underground, a coffee shop that is no longer in business) to knit and share. They were pretty cool too, not "granny spinsters" but your everyday college student. I bet some even listened to Punk. Start a club of your own! I bet you can find more peers if you looked hard enough.